Introduction. Sarcochilus species and hybrids provide an exquisite floral display, from the miniature flowers of Sarcochilus hillii to the very much larger flowers of hybrids such as S. Melba and S. Judith. The colour range, greatly extended in the last five years, now includes white, pastel pink to full red, yellow and orange, as well as flowers with beautifully patterned spots, splashes and bands. Shapes vary from the round, filled-in flowers of S. hartmannii to the round, open shape of S. fitzgeraldii flowers, the elongated flowers of S. olivaceous and S. spathulatus, and the starry or spider-shaped flowers of Rhinerrhiza divitiflora and its hybrids with Sarcochilus, adding to the beauty of this alliance. The primary purpose of this paper is to discuss the cultural conditions necessary to grow these orchids to their full glory. January, February and March – hot days and warm nights; the days are long and bright, and the humidity generally low, particularly on days with strong northeasterly winds. April and May – temperatures moderating, days becoming shorter, light intensity decreasing, humidity increasing. 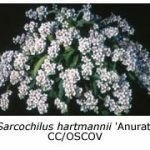 June and July – cold days and night, occasional frosts, some mornings below freezing, humidity generally high, short days, dull light. August and September – days warm, nights cool to cold, days longer, humidity generally high. October, November and December – increasing day and night temperatures, increasing day length and light intensity; usually the wettest season. My Main Orchid Growing Area is 15m long, 7m wide and 2.5-3m high. The long side faces east, while a work shed forms a large part of the western wall. The house is built using water pipe and fibre-glass for the walls and roof. This type of construction provides protection from rains and frost in winter and from the dry northeast winds in summer. No shade cloth is used between early May and early October, when maximum light is required. Doors in the north and south walls are kept open during the day to provide natural air movement. Fans, which run continuously, assist air circulation. In the warmer months (October until May) sandstone shade cloth (70% shade factor) is used to moderate the light and heat entering the house. The southern wall is also removed then to improve airflow and to allow heat to escape. The floor of the house, which is covered with scoria, is kept wet to increase humidity and assist cooling. To maintain good airflow around the orchids, they are grown on wire mesh benches at a height of 0.9m above the floor. 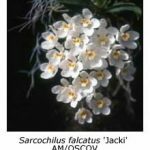 Optimising Conditions for Growing Sarcochilus. 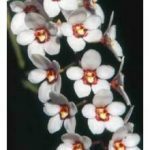 Having established the basic housing for sarcochilus orchids, we can now look at some of the factors that influence their growth and flowering. Light. Various sarcochilus species and hybrids have differing light requirements and this must be taken into account for successful culture. In my shade house there are four zones with significantly different light levels. Zone 1 – Plants at bench height near the eastern wall, where they receive bright light, particularly during the morning. This zone is most suitable for Sarcochilus ceciliae and many of its hybrids. Zone 2 – Plants at bench height in the middle of the shade house, well protected from the western sun in the afternoon. This zone provides dappled light and is suitable for S. hartmannii and many of its hybrids. Zone 3 – Plants hung below benches facing north, well protected from strong sunlight throughout the day. This zone provides plants with high humidity and low light levels and is suitable for S. falcatus, S. fitzgeraldii, S. olivaceous, S. serrulatus, S. spathulatus, S. weinthalii, Plectorrhiza tridentata, Rhinerrhiza divitiflora and selected hybrids. Zone 4 – Plants hung below benches facing south. Plants receive only indirect light. This zone provides high humidity and lowest light levels. Sarcochilushillii, young sarcochilus seedlings and plants showing stress are grown here. S. dilatatus and S. hirticalcar are grown in a heated glasshouse maintained at temperatures above 9°C and at light levels approximating those of Zone 1. 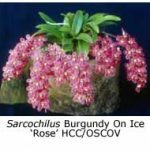 Sarcochilus species are placed in the various zones on the basis of conditions in their natural environment, although some trial and error has been necessary to determine optimal conditions of growth and flowering for some. As might be expected, hybrids are more tolerant of their growing conditions and may do equally well in two zones. In some cases, however, one parent may dominate and thus influence the choice of the most suitable zone. For example, hybrids bred from Rhinerrhiza divitiflora grow much better in the lower light levels of zone 3 than they do in zones 1 or 2. A certain amount of trial and error is needed to determine the best zone for some hybrids. Air Movement. Good air movement is vital to the successful growth of all orchids and every opportunity should be taken to use the natural airflow within the shade house. Fresh air is needed to maintain photosynthesis at maximum levels and to keep the root systems healthy. Good air movement also reduces problems caused by scale infestations and fungal infections. The most desirable level of airflow should result in gentle movement of the leaves, rather than violent disturbance. Potting Mixes and Mounts. 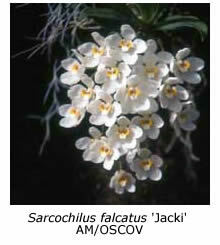 Those sarcochilus species that grow naturally as epiphytes are best grown on slabs. Under my conditions I find that tree-fern blocks or lengths of cork oak limbs (80-100 mm in diameter) give best results. These substrates retain some moisture over the course of a day and are preferable to hardwood panels and cork bark, which tend to dry out too rapidly on hot days. Some hybrids with vigorous root development also benefit from slab culture. For example hybrids bred from Plectorrhiza tridentata and Sarcochilus hillii have such massive roots that they are difficult to contain in pots. For the lithophytes, such as Sarcochilus hartmannii, S. fitzgeraldii, S. ceciliae and most of their hybrids, pot culture is the best option. The potting medium must be open, allowing air circulation around the roots and providing excellent drainage. The medium should retain some moisture and not break down too rapidly. Experiments using 100% treated pine bark, 100% stones or pebbles, and various mixtures of the two have been performed. All mixes provided satisfactory results, provided the watering conditions were adjusted to suit each type of medium. However, best results overall were obtained with 50:50 blends of bark and stone. A range of stones and pebbles has been tried over a number of years. These included scoria, heat-expanded basalt, expanded clay nodules, Versa Rock® and (recently) Absorba-Ston®. Versa Rock®, expanded clay nodules and Absorba-Stone® are all low-density, porous materials that absorb moisture. They all tend to keep the mix moist and provide a suitable environment for healthy root growth. The scoria tended to decompose, eventually forming a mud-like sludge in the bottom of the pot, and its use was therefore discontinued. Heat-expanded basalt is a low-density material consisting of spherical balls. It absorbs water, keeping the mix moist but not wet. The results were excellent but unfortunately it became unavailable. Versa Rock® has been used for three years with excellent results; its only disadvantage is that lumps larger than 5-10 mm are unavailable. Trials using Versa Rock® as the sole medium for growing Sarcochilus ceciliae have given excellent results. Root development has been very good, with little or no root loss, a problem often encountered in mixes containing bark. Expanded clay nodules (a product used in hydroponics) have been tested for a year; they provide excellent root development and top growth. Absorba-Stone® has been introduced to the trial only recently. It is available in five grades, ranging from fine (suitable for seedlings) up to 25 mm lumps (suitable for large specimen plants). Initial results are promising but prolonged trials are needed to see if there are adverse effects from long-term use of any or all of these porous materials. 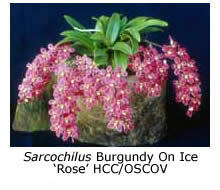 The main season of growth for Sarcochilus is autumn, although growth also continues through winter into spring. Growth perceptibly slows during summer. The best time to repot is in autumn and through the cooler months. Watering And Feeding. Watering is a critical part of sarcochilus culture. As the plants do not have pseudobulbs to store water, it is necessary to water throughout the year. The aim should be to keep the plants moist at all times, but not wet. Under my conditions I water early in the morning three or four times each week in summer, once or twice a week in autumn and spring and once a fortnight or even less frequently in winter. Keeping the humidity high during summer by misting under the benches is important to reduce plant stress. Feeding orchids is always a good topic for lively discussion. 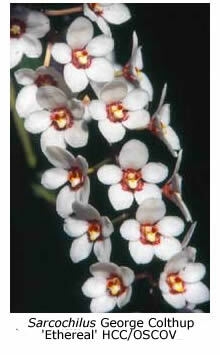 I believe that regular feeding is important to grow and flower sarcochilus orchids to their full potential. I use Peters Excel Hi K® at the rate of 300 ppm at each watering throughout the year. The pots are flushed with water every fifth watering to reduce the build-up of salts in the potting media. When I repot I sprinkle a small quantity of Zest® (treated chicken manure) just below the surface of the mix to encourage new growth. Summary. Sarcochilus species and hybrids are fascinating orchids to grow. 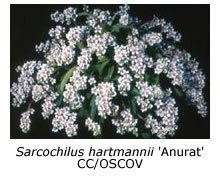 They produce masses of flowers in a range of shapes and colours. I hope that this article stimulates growers to investigate ways of optimising their growing conditions.